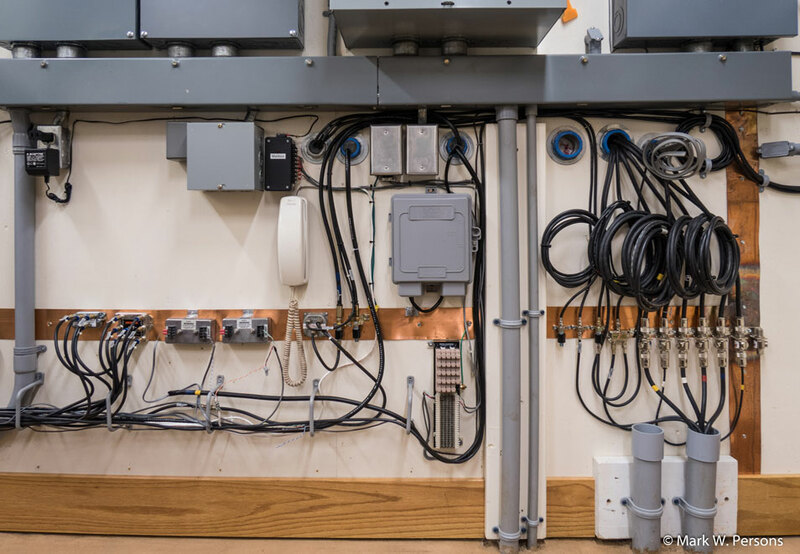 Radio World Engineering Extra's Aug. 9 issue featured an article on grounding by David Brender and was a good start for understanding the right approach to system grounding at a facility. Let me expand on it for radio stations. Most studios and all radio transmitter sites have a tower in close proximity to a building. Each tower is a skyhook to bring lightning into the facility. We should think in terms of the path that lightning will take when a strike occurs. The Nautel transmitter people have thought this through. Courtesy of Nautel, Fig. 1 shows an example of bad grounding technique. A lightning bolt can come from the tower and go through the transmitter on its way to the electrical service ground and the power line. The result is the transmitter acts as a "fuse" that can easily break open, so to speak, under high surge currents from lightning. Fig. 2 is a schematic that shows how wiring should be routed. Nautel and I concur that a reference ground, which is a single point ground, should be employed at a site to work around a possible 20,000 amperes of peak current from 1 million peak volts of lightning. The goal is to have lightning bypass expensive equipment on its way to ground. Some energy might go to the power company. Yes, I said "the power company." They might not take kindly to this, but they are a path for lightning-induced energy, too. Conversely, lightning from a power line could use a transmitter facility as a path to ground. A ground ring around the building is especially popular with cellular providers. They find it works, and we should follow their example. Note that the ring, with ground rods, connects to the reference ground at one point and nowhere else. 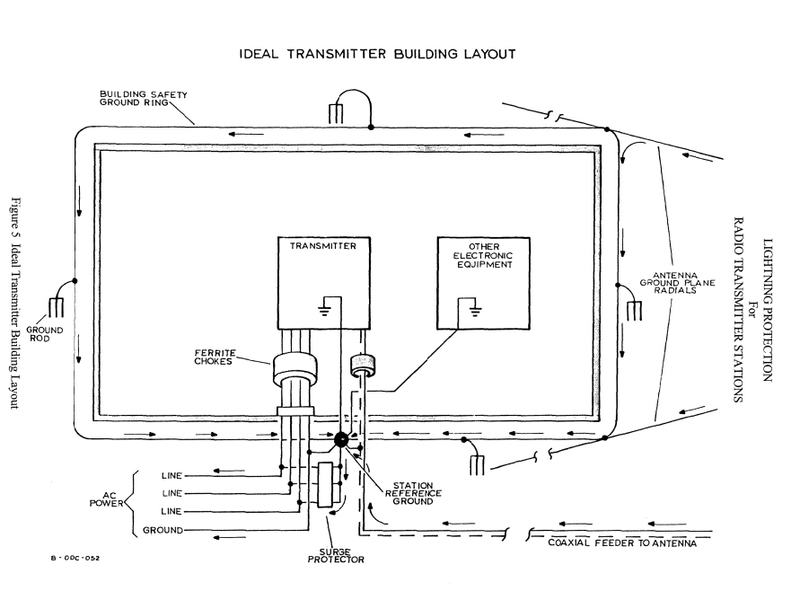 Having the transmitter and other expensive equipment on a non-lightning path is the right plan. You do that by putting electronic gear on a "stub," away from the reference ground. Lighting will come in from the tower and go to ground, not bothering to go to the stub because there is no path to ground at the equipment. Lightning should go to the reference ground instead; it will usually seek the shortest path. A stub uses that idea well. Ideally, the facility will be designed and built with all of this in mind. 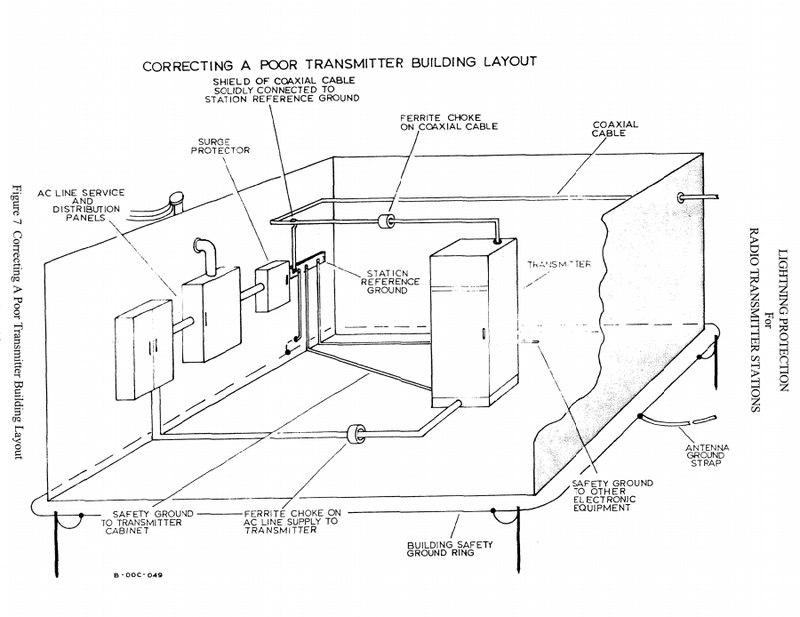 The best plan puts the incoming electrical service panel on the same side of the building as the tower. But that may not be the case in a facility you are working on. 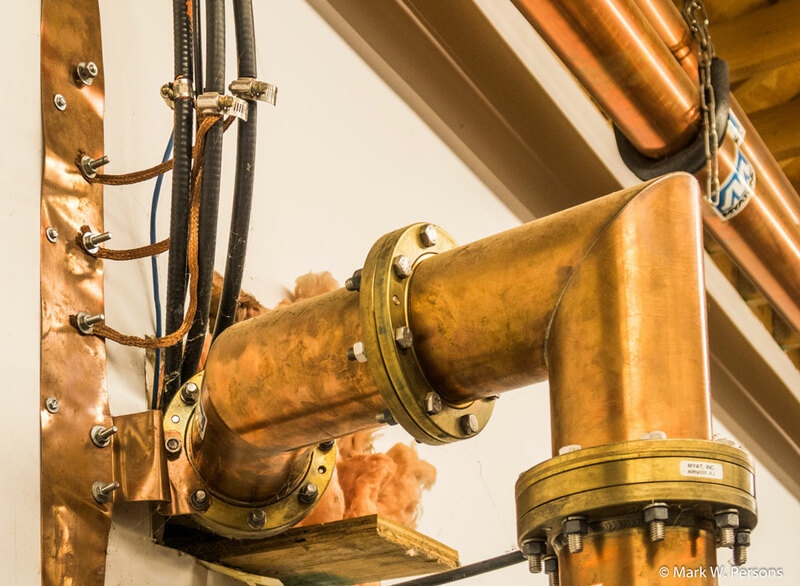 The task then is to route cables and grounds to produce the same results electrically. Easier said than done sometimes, but worth the effort, if it prevents just one equipment failure. Fig. 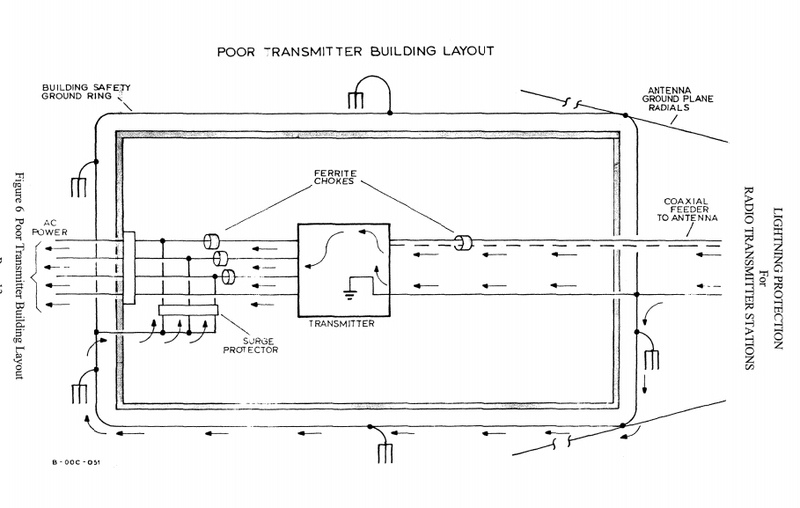 3 from Nautel shows the mechanical layout of a transmitter plant with grounding designed to route lightning away from expensive equipment, using the stub idea. Most transmitter manufacturers send ferrite cores with their equipment for isolating power cables, coaxial cable lines, control cables, monitoring samples and audio feeds from lightning induced surges. You should look into purchasing some if your equipment does not have them. Ferrite cores tend to block lighting from traveling down a conductor. They are easy to install and are worth every penny. Surge protection to reference ground at the power feed and other outside lines is important, too. There are many surge arresters on the market from brands like Eaton, EP2000, LEA, Transtector and others. The idea is to clamp excess voltage to safe levels. Fig. 4, from a facility I built, shows a reference ground at the electrical service entrance panel on the right. The National Electrical Code prohibited this at one time but now it is OK. Some local electricians and electrical inspectors may not be up to speed on the rule change. Note a 3-inch copper strap was laid down so protection devices could be attached easily. Best to use stainless steel hardware to prevent corrosion by dissimilar metals. One trick to prevent or reduce lightning surges on coaxial lines is to coil five or six turns of line to ?choke? lightning, thus preventing it from continuing down a line into the building. That is because lightning does not follow curves well. It wants to go straight. Each cable then goes to a surge protector, which is bolted to the strap. You can see that on the right side of the photo. PolyPhaser and CommScope are well-known brands. These devices limit the voltage between the center and outer conductors of a coaxial cable. They need to be attached firmly to the reference ground to do their work correctly. Fig. 5 is almost as good. Again, all coaxial cables go to reference ground as they enter a building. Chris Kreger at RF Specialties Group tells me the company does a brisk business selling lightning-protection products during storm season. The best approach is to install protection before lightning hits. On the other hand, we should look at ways to prevent lightning strikes or reduce the intensity of strikes when they occur. One such technology is static dissipaters. The most well-known brand is Nott Ltd. They manufacture stainless steel needles that bleed static charges from the sky to ground. The goal is to reduce the voltage between the sky and ground so lightning will strike elsewhere or be greatly reduced in amplitude so a strike is less damaging. Fig. 6 shows a Nott EN-1 Eagle's Nest high on a tower. One dissipater typically is placed at the top with smaller dissipaters every 100 feet or so down the tower. 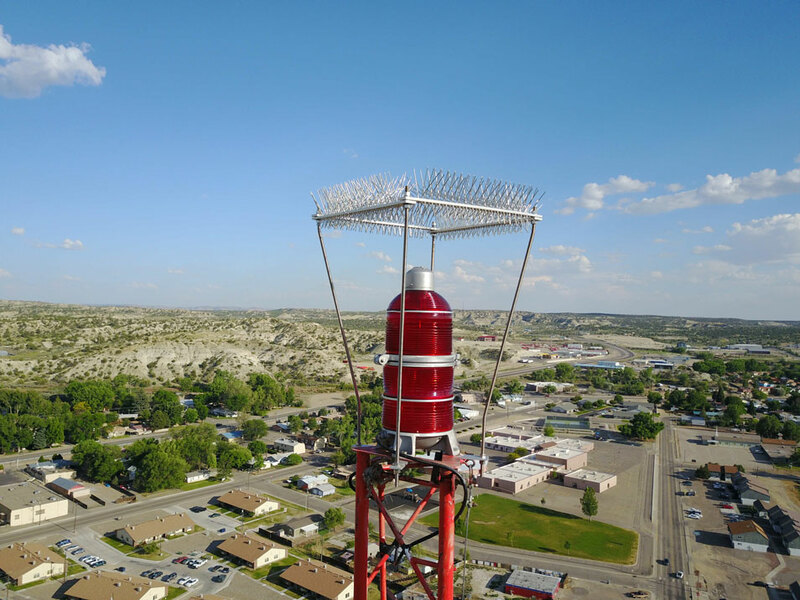 Here's a real-world example: There is a three-tower AM transmitter site that suffered lightning damage every summer without fail. I was the contract engineer for the station and my request for static dissipaters was ignored. Another of my clients purchased the station and bit on the proposal to add static dissipaters to all three towers. The hardware cost was about $2,500. Tower climbers put them on during normal inspection work. The investment paid off. Not one lightning-related problem has occurred in the 18 years since. Even when a tornado took down one of the towers, the rest of the facility survived without lightning damage. To be truthful, there is no sure-fire method of protecting a facility from lightning, but thinking it through and working accordingly will go a long way to preventing problems. 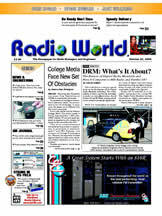 November 2, 2017: Hello Mark, Great read in your excellent article in the new Radio World. Best Regards, Randy Klock, Nott, Limited, Farmington, New Mexico. October 31, 2017 email: Hello Mark, Another excellent Radio World article addressing a really important topic. Timely as well ... was just chatting with a conferrer that very nearly ever station I had visited in the previous month was ALL SOLID STATE ... not even any of the classic 'junk' on the shelves had any tubes. The great jeopardy to these plants is from lightning and line surges and most of these sites have next to nothing to protect from these hazards .. OR if they do, not properly configured. Best, Buc Fitch PE, Avon, Connecticut. See you down the road a bit. I'll leave the soldering iron on for you. Mark Persons, W0MH.